Mindfulness Journeys invites you to explore with us the fastest growing area of travel, with well being travel growing at double the pace of ordinary travel. Our decades of expertise in both mindfulness training and travel are there to meet your needs. 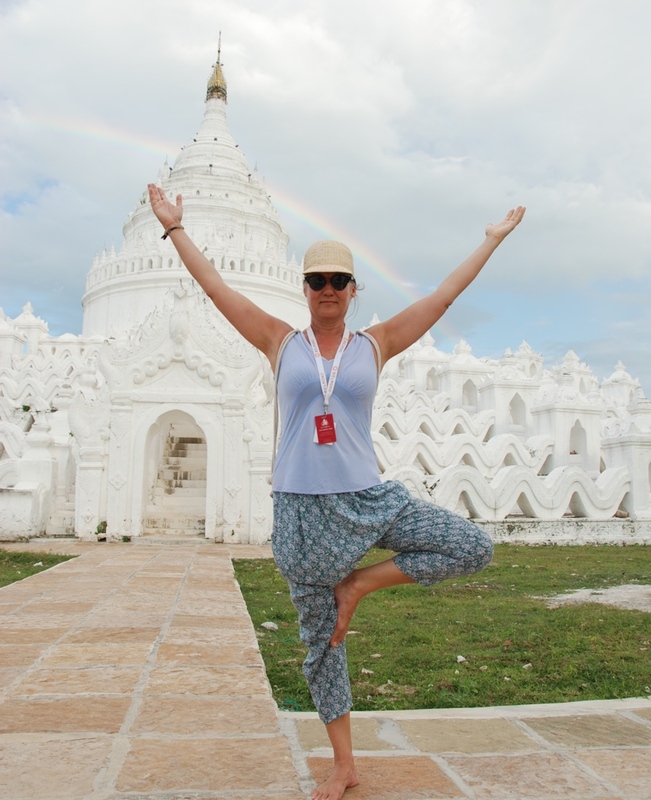 Mindfulness Journeys teamed up with Belmond Group and established the ‘Road to Mandalay River Cruise’ to provide mindfulness and well being training in a truly unique setting. While cruising along the Ayeyarwadi River in the heart of Myanmar, our meditation and Tibetan yoga classes offered voyagers a special glimpse into the ancient yet modern world of meditation and the secret practices of Tibetan yoga. Mixing well being with the pleasure of luxury travel proved to be a winning combination for travellers searching for excellence. Mindfulness Journeys’ teacher Brian Hilliard presented a series of meditation sessions within ancient pagodas and temples of Bagan, and onboard the boat. 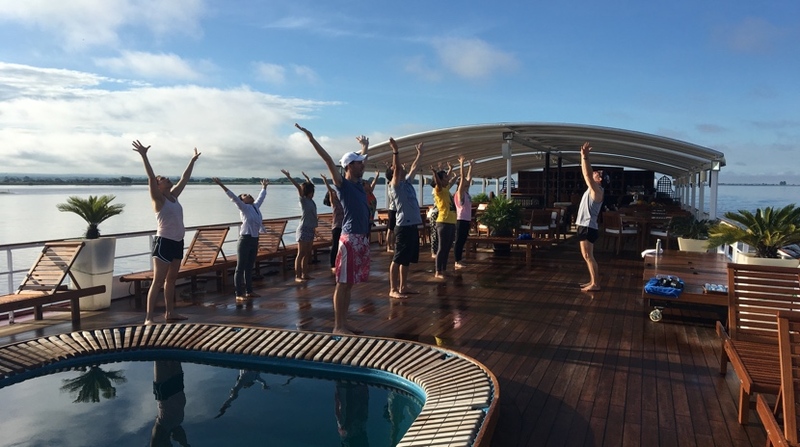 Co-teacher Shannon van Staden taught the Tibetan Yoga practices on the upper deck to large groups of eager travellers. Together the two yogas offered valuable training to take back to the professional world, tools for a high-stress world. Contributing to the power of mindfulness practice was the backdrop of a country steeped in these ancient wisdom traditions. Onboard there was deep curiousity about the practices and how they contribute to a better, more balanced and sane life. Lively discussions followed periods of silent meditation, people’s innate intelligence sparked by blending intellect and intuition. Wonder at the splendor of ancient monuments was matched by glimpses into the workings of busy modern minds. Travellers disembarked with something new and intriguing — an experience to come back to anytime in daily life. The combined power of memories of special places and meditation/yoga practices can provide the impetus for positive change, not only individually, but for organisations as well. Over dinners many an hour was spent discussing topics related to the social impacts of personal meditation discipline. The special environment created by the group unexpectedly opened avenues of sharing. There was a recognition by boat staff, many of whom are meditators in the Burmese tradition, that mindfulness instruction requires a western approach for western minds. There was a deep mutual respect for our different traditions. Not all travellers participated in all of the training sessions, and with each on-land excursion there were options which included or not the meditation or yoga training. This gave everyone plenty of room to follow their interests at the time. However, there was a big surge of interest when the boat was sailing between ports and options were limited. Guests really welcomed the opportunity to turn their sights inward as the ancient pagodas faded into the distance. Of special interest to many of our guests (and crew) was the instruction on Tibetan Yoga. This vigorous yoga practice, done on your feet, brings well-being right into movement. After all, not everyone wants to sit still all the time, and our special knowledge reaches into the area of meditation in movement and in daily life. Participants were very surprised at how accessible and effective mindful movement is in working with bodies often immobile for long hours. Mindfulness Journeys will adapt to any kind of journey, mixing mindfulness and yoga with the adventure and relaxation of travel. Any venue provides it’s own unique auspicious opportunities. Provided travellers have some expectation of authentic well-being training, we will survey the landscape and locate the ideal moments and places for effective instruction. On the Road to Mandalay, sometimes a private and personal one-on-one was just the thing a guest required. At other times there was the impact of rousing group interaction. To discuss how you can incorporate mindfulness teachings, meditation and yoga into an existing travel product, or to create a new offering within your business, please contact us.